A menacing little rose-infused face mask. 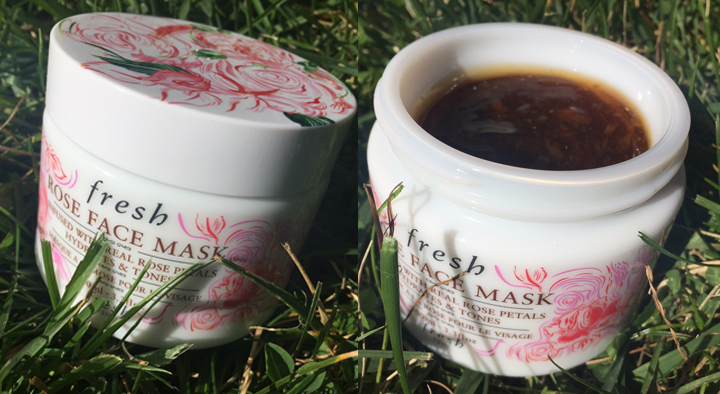 When I was asked if I wanted to try the Fresh Rose Face Mask, I was like, “totally” … sounds wonderful! I could not wait to open the box when it arrived, and let me tell you, it did not disappoint. The container alone is stunning white glass, emblazoned with a delicate illustration of roses by artist Jo Ratcliffe to celebrate the product’s 15th birthday. I opened the jar right away and breathed in the beautiful and uncanny scent of rose that only real rose petals and rose water could produce. I have reviewed other products that didn’t require taking any “me” time. I have tried lotions ‘n potions that I could slap on in auto-pilot, morning or night, but for whatever reason, a gorgeous product that could only make me a happier and more chill human being, was freaking me out. But not tonight… tonight I will have my 5-10 minute date with a certain Fresh Rose Face Mask. I will turn off my phone. I will put my phone on silent. Ok, I’ll try not to look at my phone and I will apply the rose and cucumber-infused gel generously, so as to make up for lost time and I will report to you what the outcome is. I am so relaxed that I can barely write this. No, seriously, it was a lovely experience. The rosey gel was cooling, soothing and of course smelled like a gorgeous bunch of real roses. The mask contains many wonderful and natural ingredients, but the most notable are the roses, cucumber and aloe. I was going for the full 10 minutes, but my face began to tickle so I stopped at 7 minutes. After rinsing the mask off, drying my skin and applying my night moisturizer, my skin still feels very cool and refreshed. Take that!!! … A little rosey outlook in a jar! I’ll see you tomorrow night for another 7 minutes of me time. I love Fresh products! I will have to check this out!